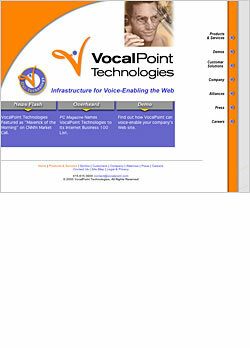 VocalPoint Technologies was a San Francisco based B2B company that provided a ground breaking voice recognition technology for browsing its clients’ Web sites via any telephone. The Web site’s design, developed with the MRK Design Group of San Francisco, is integrated with the company’s print collateral to create a consistent design system that reinforces the corporate branding. The company and its technology have been acquired by one of its partners and now operates under a new name.